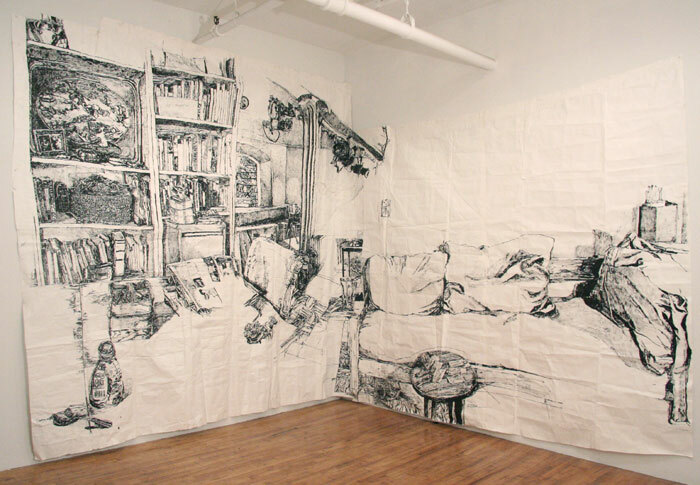 Dawn Clements is known for her detailed large scale works on paper, drawn with sumi ink or ballpoint pen, depicting interiors -- her own, other's or ones she captures from movies. This carefully staged exhibition at Pierogi advances her work into new territory. Her new series, presented in the main room of the gallery, results from a three year collaboration with sculptor and ceramic virtuoso Marc Leuthold. This collaboration is all the more interesting because Leuthold's beautiful sculptures are not only incorporated into the drawings but are also physically present as part of the installation. 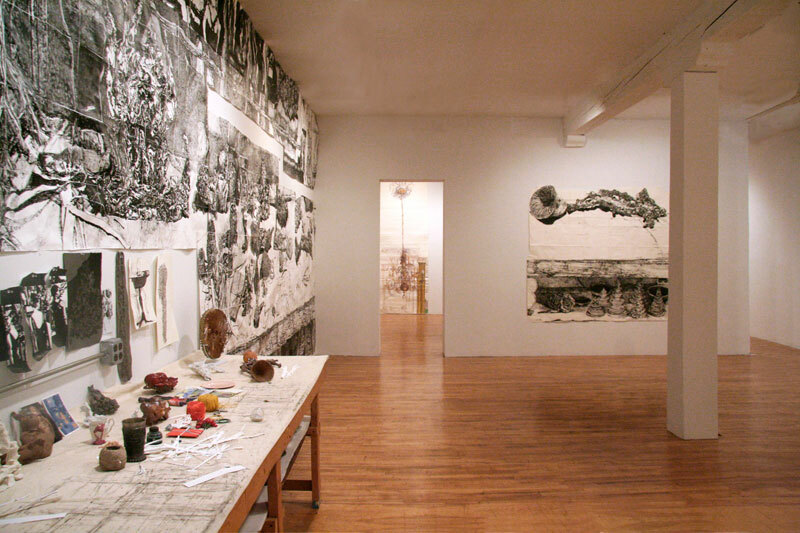 In the main gallery space, a gigantic drawing measuring 303 x 126 inches entitled Table of Work is endowed with a long working table -- a well-considered appendage. 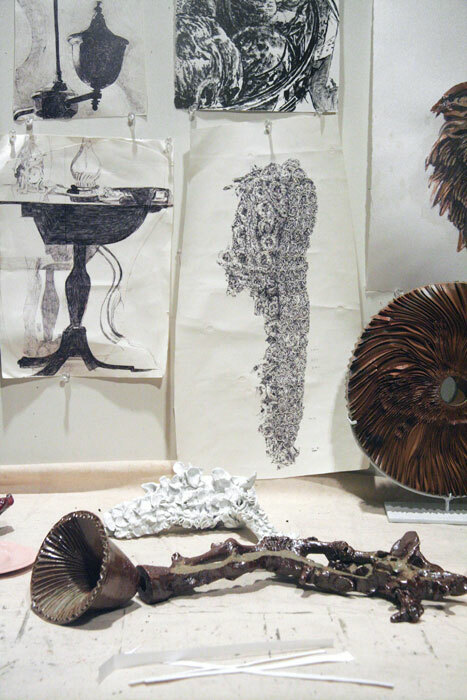 The tabletop bears the delicate organic sculptures that are represented in Clements' drawings that fill the room. Behind the table, the tour de force drawing, in sumi ink, shows the same table in a different context, that of the artist's studio. Here Clements expands and flattens the view of the table and its contents, as well as what is hanging around it, on the studio walls. I use the term tour de force here because of Clements master touch with sumi ink, but also because the drawing is an assemblage of individually elaborated drawings on 10 x 8 inch sheets of paper. The artist created this entire wall by addressing each of individual sheets through the lens of that particular drawing, and then adding it to the whole. Perspective is very important to her, but not in a traditional, one-point-perspective sense. Clements allows her compositions to present their own hierarchy. Each object gets equal attention and may be drawn in a scale similar to something more distant or something very close. The viewer is allowed to contemplate these sculptures, present or represented, and may find themselves happily lost in observing the details of a ball of string, cut paper garlands, icons, electrical cords and outlets or dried flowers. The other walls of the main room interact very interestingly with this first wall. On each of the 3 walls are drawings of the sculptures that populate the table, sometimes drawn individually, sometimes as a group. Here, Clements uses gouache as well as sumi ink. The spare hanging of this part of the installation contrasts sharply with the loaded wall. Once you turn your back to the latter, it suddenly seems very quiet. The colors used in these representations amplify this contrast. The sculptures and drawings are literally resonating and this room perfectly incarnates the rich and deep collaboration. The second room is smaller but the same dialectic is at work--vast versus intimate. In this room, the subject matter of the drawings is different. These subjects range from objects, to quiet and dark movie scenes, to Susan Rethorst's living room. In the drawings' margins are notations and snippets of text that allow you to see glimpses of what the artist may have been listening to or thinking of when she was working. This room is more confined than the first and you almost feel that you are entering the artist's home after going through her studio. It is psychologically denser too, maybe because lonely figures appear in two beautifully executed ballpoint pen drawings; Jessica Drummond in Bed (My reputation, 1946) and Barny (Leon Morin, Priest, 1961). 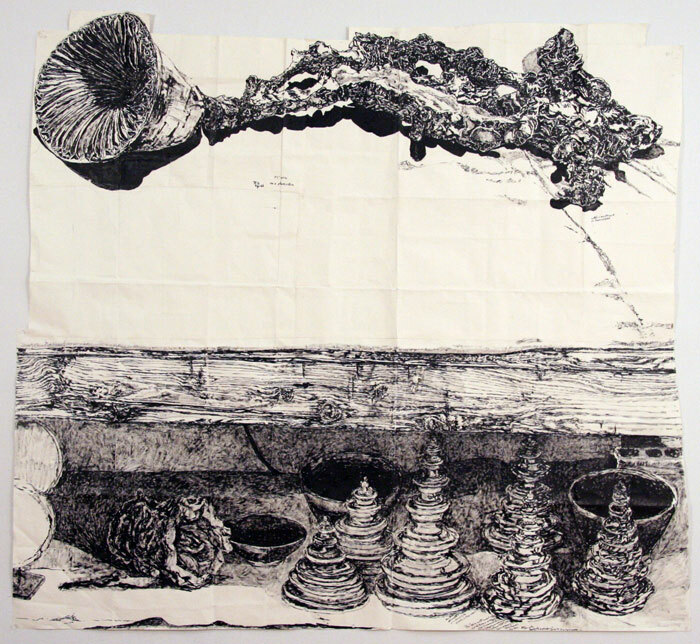 All the drawings collide and let the viewer/wanderer project his body and narration into the places and objects presented. This expanding landscape, at times panoramic, at times cinematic--or sequenced if you prefer, leaves us in a contemplative state that endures long after you leave the gallery.